Exclusive to Harrods, Bond No. 9 London Celebration has been created especially to commemorate Her Majesty Queen Elizabeth’s The Diamond Jubilee. The floral scent arrives in a beautifully illustrated flacon depicting a Buckingham Palace scene; the perfect keepsake to commemorate this special occasion. The notes feature lantana leaves, dates, mace, orange rose, tuberose, orris, amber, musk and sandalwood. Bond no. 9 London Celebration is available in 100 ml Eau de parfum, £300. LOVE that bottle!!! No sure about the juice tho..too bad it’s so expensive. It’s quite perfect, but for some reason I don’t want it. Would be like having a commemorative plate or something, if that makes sense — it’s too time & place specific or something? That totally makes sense! Now that you mentioned commemorative plate..it just became much less appealing! Lol! Sorry, did not mean to talk anybody else out of it! You didn’t lol..don’t worry:). I’ll probably forget about it in a few days or few hours..lol. I read about too many new releases to remember them:). Unless something really is yelling at me, waving me down for me to sniff it. The juice doesn’t seem like one I will run out and try, I was just admiring the detail on the bottle a bit. That bottle is quite something, must admit! Stunning bottle. Anyone know what Lantana leaves smell like? I thought Lantana is an Australian vine that is so prolific it is an invasive weed. Not sure I’ve encountered it in a perfume before. In the ad copy for Bond no. 9 Saks-en-rose, they used the phrase “verbena-like lantana leaves”, if that’s any help! Thanks, that gives me the general idea! The bottle looks amazing, the juice sounds lovely…but the price is just to laugh at. Not a chance I will buy it. Love that bottle and definitely want to try it–I have recently become fascinated by date note perfumes. Wonder if they’ll have samples at the NY store or online? Doubt I will be able to buy a bottle at that price, but still…..
Wow! I adore that bottle but meh on the juice. The fragrance notes are almost identical to those of their Sask-en-Rose fragrance. The only difference is, that Saks-en-Rose listed mate-tea as a note. 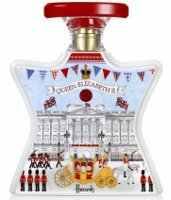 I’m liking the bottle but all these commemorative scents that have been tossed out in the past year based of the royal wedding and now the jubilee are starting to grate on my nerves. I’ll take a t-shirt instead. I didn’t watch any of that wedding, lol. I think when something is big deal with so many people..I become *really* uninterested. I prefer niche weddings, lol! Bad fume joke, I know. Beautiful bottle, but the tuberose is a deal-killer for me. Omega – LOL! I prefer niche weddings myself! Ouch, this is exciting but not cheap! The notes sound like a lovely quirky combination. I grew up with lantana in our garden (for the pretty purple flowers). I don’t think any of us knew then that it was an invasive weed. Years later, as a journalist, I did a story about lantana, how it takes over everything and about environmentalists’ attempts to root them out. A very non-pc plant, but none of that took anything away from the half-mossy half-astringent delight of crushing and deep-sniffing lantana leaf from our garden. I can just imagine this going very well with mace too. I will try it when I go to London in July. Tks for posting, Robin. Is it wrong that I am not the least bit interested in anything celebrating the queen’s Jubilee? I would be more interested in a scent inspired by Freddie Mercury, Queen, and Bohemian Rhapsody. Are dates new as a perfume note? I can’t remember seeing them elsewhere. I like to eat them, but I never noticed any particular aroma – of course, if I were to invent a smell for dates, it would be warm and rich. Not new, but there might be some new aromachemical that is responsible for it appearing so often lately — I really don’t know. London Celebration is just a shameless cash-in, as far as I’m concerned. If you live in London and come across those British souvenir shops on a regular daily basis, you will realise how gaudy the bottle design is. As for the Queen’s Diamond Jubilee, I really couldn’t care less – apart from contributing towards tourism, it’s not as if she does much for the UK these days. But thank you for the extra Bank holiday, ma’m (even though we have one of the lowest number of bank holidays, per calendar year, in Europe). I’m so over the Bond #9 line. Too costly to own and I think slapping a new design on the same tired bottle is less than creative. Does anyone else keep wishing they would do a Bond, James Bond, by Bond no. 9? Just for fun, I googled “Queen Elizabeth” and “lantana” to see what the connection might be. I learned that in 2011, lantana (apparently a highly invasive species) was identified as a serious threat to native wildlife & plant species in Queen Elizabeth National Park in Uganda. According to the International Union for Conservation of Nature (IUCN), lantana “is capable of preventing all other plants from growing under and near it and forms single-species stands that exclude all other plants and any land uses.” Yikes!